Sharon Daniel Salon Pre-Book Contest 2018! HELP US WELCOME STYLIST MIRANDA TO THE SHARON DANIEL SALON TEAM IN SCHAUMBURG, IL! 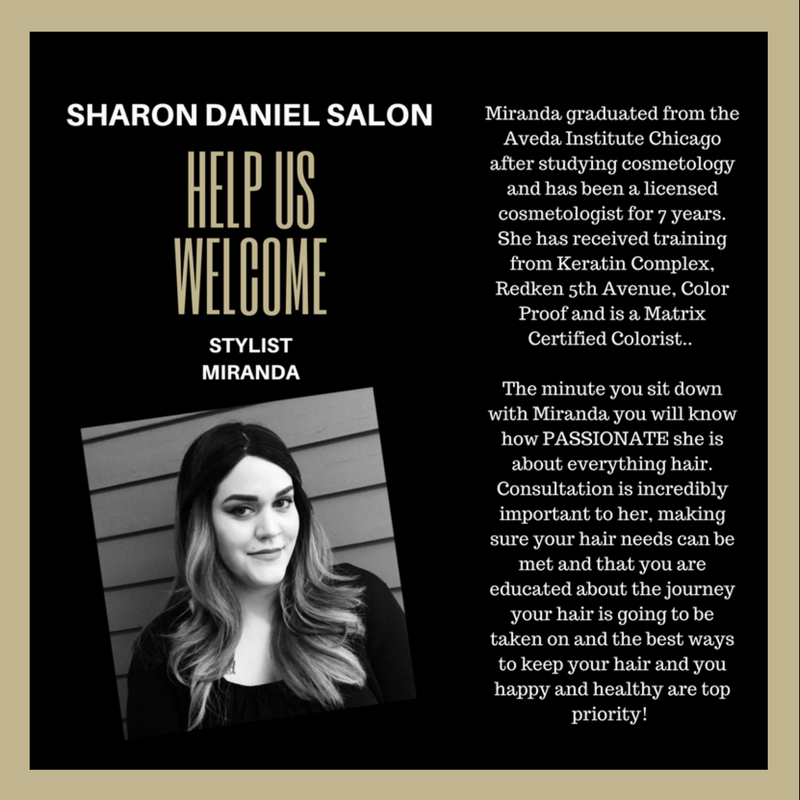 HELP US WELCOME STYLIST MIRANDA TO THE SHARON DANIEL SALON TEAM IN SCHAUMBURG, IL! WE ARE SO EXCITED! MIRANDA GRADUATED FROM THE AVEDA INSTITUTE CHICAGO AFTER STUDYING COSMETOLOGY AND HAS BEEN A LICENSED COSMETOLOGIST FOR 7 YEARS. SHE HAS RECEIVED TRAINING FROM KERATIN COMPLEX, REDKEN 5TH AVENUE, COLOR PROOF AND IS A MATRIX CERTIFIED COLORIST. THE MINUTE YOU SIT DOWN WITH MIRANDA YOU WILL KNOW HOW PASSIONATE SHE IS ABOUT EVERYTHING HAIR. CONSULTATION IS INCREDIBLY IMPORTANT TO HER, MAKING SURE YOUR HAIR NEEDS CAN BE MET AND THAT YOU ARE EDUCATED ABOUT THE JOURNEY YOUR HAIR IS GOING TO BE TAKEN ON AND THE BEST WAYS TO KEEP YOUR HAIR AND YOU HAPPY AND HEALTHY ARE TOP PRIORITY! 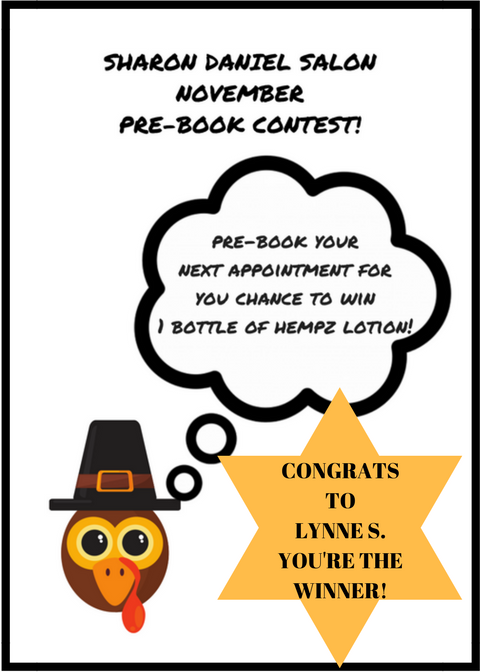 Congrats to Sharon Daniel Salon Client Lynne S. You're The Winner Of The November Pre-Book Contest! Congrats to Sharon Daniel Salon Client Jennifer I. You're the Winner of the October Pre-booking Contest!! Congrats to Dee M..! You're the winner for the Sharon Daniel Salon September Pre-Booking Contest! 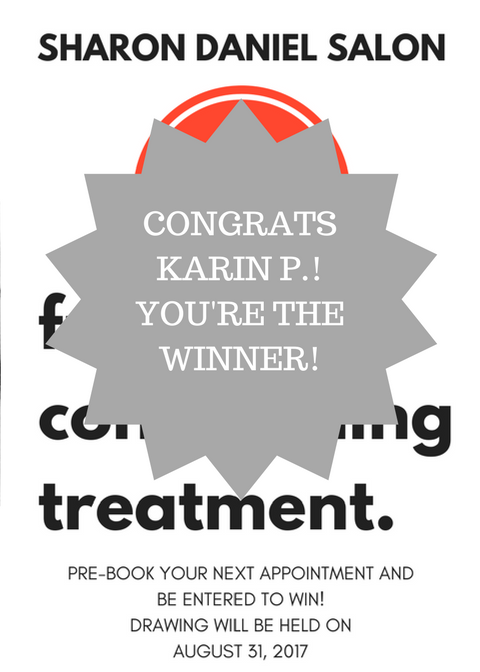 Congrats to Karin P.! 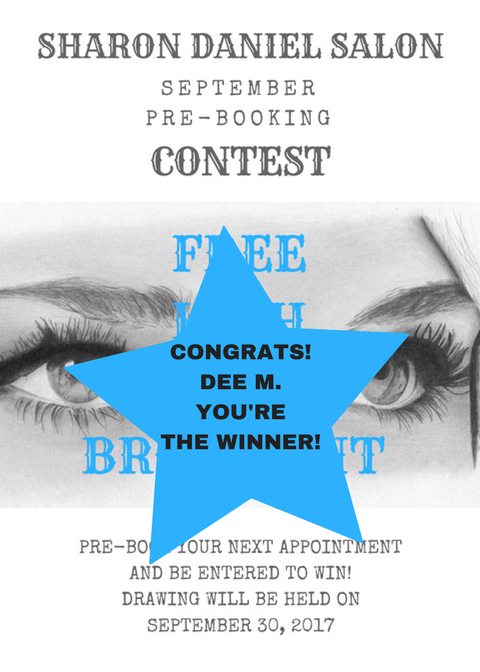 You're the winner for the Sharon Daniel Salon August Pre-Booking Contest! Congratulations to Sharon Daniel Salon Client Miriam S.! Sharon Daniel Salon On-Site Bridal Hair Performed By Stylist Ashley! Sharon Daniel Salon July Pre-Booking Contest! Congratulations to Sharon Daniel Salon client Pat R.! You're the winner of the June Pre-Booking Contest! 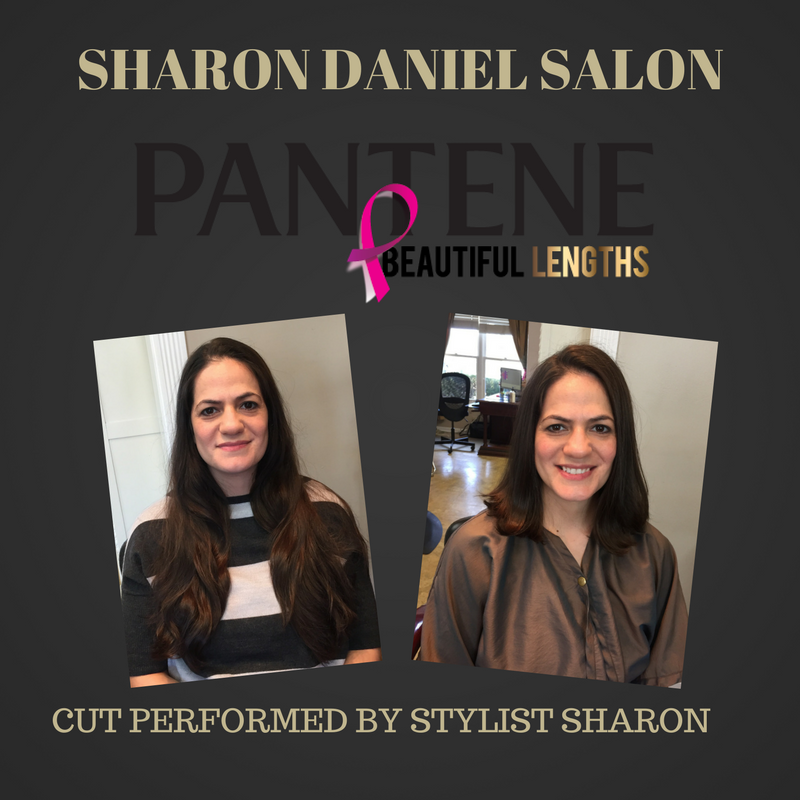 Sharon Daniel Salon is proud to be apart of Pantene Beautiful Lengths! We have a winner! Congrats to Sharon Daniel Salon client Maureen K! CONGRATS TO OUR SALON CLIENT SARA W.! 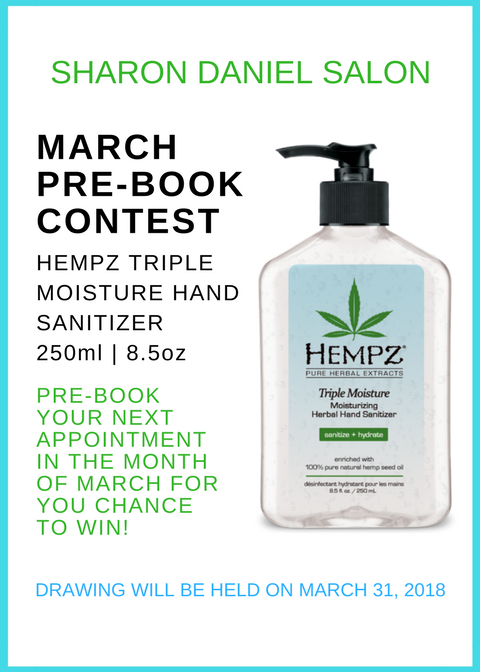 YOU JUST WON THE PRE-BOOKING CONTEST FOR MARCH! 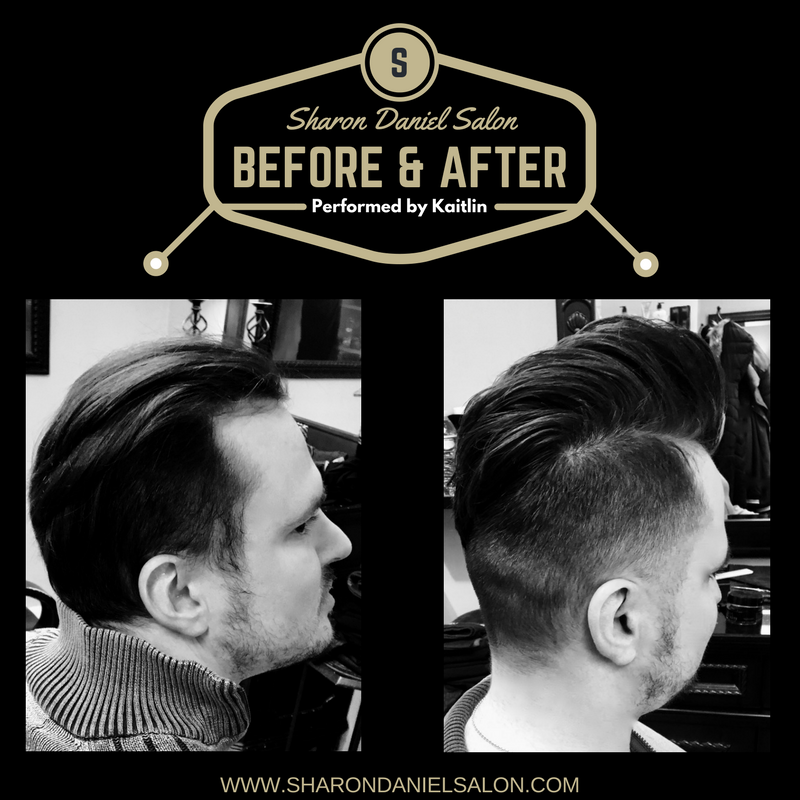 Before & After Men's Haircut & Style Performed by Sharon Daniel Salon Stylist Kaitlin!